Nintendo's been pro-active during this generation to support and promote game development from smaller studios around the world, helping the eShop to be a vibrant platform on both Wii U and 3DS. Another project is now set to get underway, and this time it'll be utilising development talent in Singapore to bring 3DS eShop games to a 'global audience'. 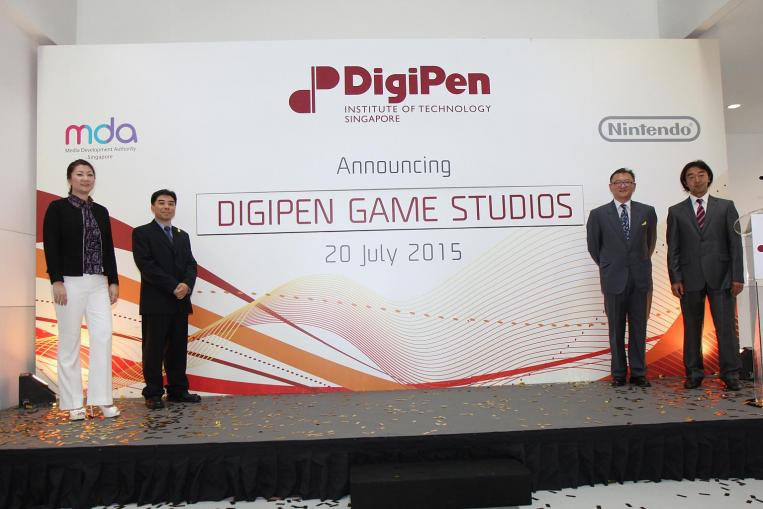 As reported by The Straits Times, Nintendo has announced a partner with "video games and digital media university" DigiPen to launch DigiPen Game Studios. This company will seek out and support developers in Singapore and provide mentorship and assistance to bring their games to the 3DS eShop. This year will also bring the first DigiPen Game Conference, and developers will have a chance to submit their projects for selection into the programme. It seems like a bold project - DigiPen hopes to select and begin progress on ten 3DS eShop games by 2016, and Nintendo will provide marketing assistance. It'll be interesting to see if any particularly intriguing games come out of this, and whether more promotions along these lines will continue to arrive in different countries. I'm looking forward to seeing what comes out of this. I wouldn't be surprised if NX really is basically Nintendo Ouya for some reason. Nice, great to see Nintendo assisting devs more, even students. Now we just need a competent account system to carry all these games. @RCMADIAX They have a branch in Singapore. @IronMan28 yup. I feel the 'NX' will mainly be digital. They are setting up lots of small studio devs in the background to make sure they have at least loads of digital games ready at launch, along with their own 1st party games. I like it, they are planning ahead for, hopefully, a solid launch of the 'NX', when ever that will be, 2016 or 2017. I just really hope it doesn't actually turn into what the OUYA is right now. Eh, Singapore? Is game development becoming a big thing there? I mean, I'm intrigued to see what kind of stuff they will present us, but this just comes out of left field! @AVahne Good thing they have one, eh? That's good. Too many titles are Wii U only. The love for the little console is weakening. All the big games have jumped ship to home consoles, despite the higher CPU of the New 3DS. Have there been any New 3DS exclusive indie titles? Didn't think so. Good news! South East Asia is rarely known in game development scene, so hopefully this could bring more talent from this side of the world. I'm happy Nintendo is supporting this and hopefully to the rest of the SEA countries too. @readyletsgo "I just really hope it doesn't actually turn into what the OUYA is right now." I was going to ask what the OUYA is now, but then I realized I don't actually know what a OUYA is, and that might be the problem. It's an android based micro console, great in theory, but it reality it's a devs worst nightmare. Great for emulation and watching free stuff, easy to hack. Terribly uncomfortable controller, failing in sales since launch and is technically part of the 8th gen of systems. Am I right in saying that DigiPen and Nintendo have a long history together ever since the foundation of the institution? I wish Nintendo would actually pay the Middle East some more attention in some way notable.